This simple, elegant design will bring classic style to any celebration. Design: Thick vertical stripes and an elaborate frame. 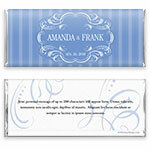 Personalization: Front names and date, with a back message.